The front-facing camera on the BlackBerry PlayBook has finally found some use. The company today announced the availability of the Video Chat application, a easy and fun way for friends and family to place and receive video calls between BlackBerry PlayBook devices connected to Wi-Fi. This application features powerful in-call functions that will let users switch cameras from front to rear to show friends what they are seeing. A friends list makes it easy to manage your favorite contacts and keep track of received and missed calls. The BlackBerry PlayBook Video Chat application will be shown this week at BlackBerry World. We will be there live to give you complete coverage. 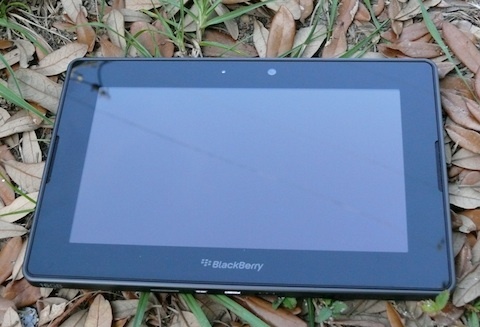 PlayBook users can expect the application to go live May 3 through a OTA software update and through BlackBerry App World. Waterloo, ON – Research In Motion (RIM) (NASDAQ: RIMM; TSX: RIM) today announced the availability of the BlackBerry® PlayBook™ Video Chat application – an easy and fun way for friends and family to place and receive video calls between BlackBerry® PlayBook™ tablets over an internet connected Wi-Fi® network. • One-Click Video and Voice over Wi-Fi Calls – with just one click users can make a call from their Video Chat contact list, log of recent calls or simply by entering the BBID email address of the person they want to call. • Incoming Call Notifications – users will receive a notification pop-up when a new video call comes in, allowing them to accept the call as either a video or voice call, or decline the call. For those quiet moments – such as when while watching a movie or playing a game -users will also have the ability to simply set the “Do Not Disturb” option and the BlackBerry PlayBook will automatically ignore all incoming calls. • Powerful In-Call Functions – by using the picture-in-picture function users can easily preview their own video image prior to placing the call in order to see what will be displayed on the other end. They can also easily switch cameras from front to rear so their friends can see what they are seeing, and for private moments users can mute/unmute audio or make or take calls using voice only. • Friends List – BlackBerry PlayBook Video Chat comes complete with a Friends List for maintaining your favorite contacts. A picture can easily be added to a contact to personalize the entry and a Call Log makes it simple to keep track of received and missed calls. The BlackBerry PlayBook Video Chat application will be showcased this week at BlackBerry World 2011 (www.blackberryworld.com) in Orlando FL. It is expected to be available on May 3 and will be distributed to existing BlackBerry PlayBook customers through an over-the-air software update and will also be available on BlackBerry App World™.